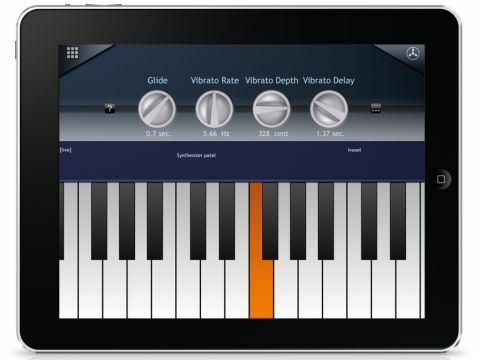 A clever and controllable vocoder app that sounds great. Great fun to use. Entertaining and sometimes useful results. Multiple pages can be frustrating. Sequencer is a bit quirky. VirSyn hit the App Store once again with iVoxel, an advanced vocoder that borrows from its Matrix plug-in and produces a clear and (mostly) intelligible sound. There's quite a bit of control available; carrier waveforms can be altered, along with pitch, breathiness, cutoff and time "warp". You can use the vocoder live with the on-screen keys or sequence any of the 200+ pre-recorded voice snippets ("voxels"). You can record your own voxels using the built-in microphone. The sequencer is a piano roll affair, and you can adjust the pitch and length of the voxels. It's a little fiddly, but the results can be quite entertaining and even inspiring. Your efforts can be documented with the built-in recorder and uploaded to your desktop computer via Wi-Fi. You can copy audio to the clipboard to sling it over to other apps like ReForge or Jasuto. iVoxel is a blast to use, though it can be frustrating at times, with its many pages and slightly quirky sequencer. Nevertheless, there is a lot of fun to be had, the sound is splendid and the price is certainly right. Note that iVoxel will work with the original iPhone and iPhone 3G, but at slightly reduced audio quality.